The user is provided with the ability to analyze one or more directories, disks or network shares, detect directories and files holding significant amounts of the disk space, display pie charts, export disk space usage reports and perform multiple file management operations such as file copy, move and delete. 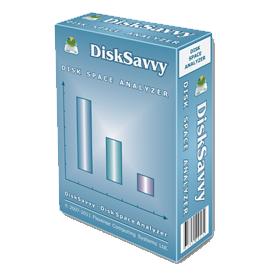 In addition, power computer users are provided with advanced product versions, DiskSavvy Pro and DiskSavvy Ultimate, which are capable of processing significantly larger amounts of files, allow one to analyze specific file types, provide additional report formats, allow one to perform disk space usage trend analysis, etc. Finally, IT and storage administrators are provided with DiskSavvy Server, a server-based product version, which runs as a service in the background and allows one to submit disk space analysis reports from multiple servers or desktop computers to a centralized SQL database, analyze disk space usage per host, analyze the amount of used disk space per user, define custom rule-based disk space analysis actions, etc.